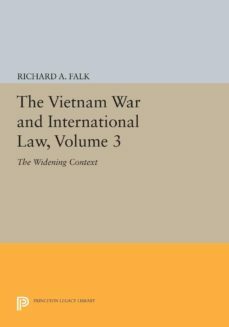 Issues of the war that have provoked public controversy and legal debate over the last two years—the Cambodian invasion of May-June 1970, the disclosure in November 1969 of the My Lai massacre, and the question of war crimes—are the focus of Volume 3. As in the previous volumes, the Civil War Panel of the American Society of International Law has endeavored to select the most significant legal writing on the subject and to provide, to the extent possible, a balanced presentation of opposing points of view. Parts I and II deal directly with the Cambodian, My Lai, and war crimes debates. Related questions are treated in the rest of the volume: constitutional debate on the war; the distribution of functions among coordinate branches of the government; the legal status of the insurgent regime in the struggle for control of South Vietnam; prospects for settlement without a clear-cut victory; and Vietnams role in general world order. The articles reflect the views of some forty contributors: among them, Jean Lacouture, Henry Kissinger, John Norton Moore, Quincy Wright, William H. Rhenquist, and Richard A. Falk.Originally published in 1972.The Princeton Legacy Library uses the latest print-on-demand technology to again make available previously out-of-print books from the distinguished backlist of Princeton University Press. These paperback editions preserve the original texts of these important books while presenting them in durable paperback editions. The goal of the Princeton Legacy Library is to vastly increase access to the rich scholarly heritage found in the thousands of books published by Princeton University Press since its founding in 1905.